In this volume, Finney argues that the conflict in 1 Corinthians is driven by lust for honour and Paul's use of the paradigm of the cross. Studies in contemporary social anthropology have noted the importance of male honour and how this is able to generate ideas of social identity within a community and to elucidate patterns of social behaviour. 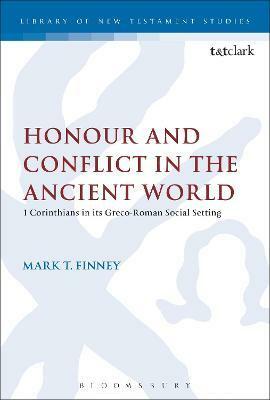 Finney examines the letter of 1 Corinthians , which presents a unique expose of numerous aspects of social life in the first-century Greco-Roman world where honour was of central importance. At the same time, filotimia (the love and lust for honour) also had the capacity to generate an environment of competition, antagonism, factionalism, and conflict, all of which are clearly evident within the pages of 1 Corinthians . Finney seeks to examine the extent to which the social constraints of filotimia, and its potential for conflict, lay behind the many problems evident within the nascent Christ-movement at Corinth. Finney presents a fresh reading of the letter, and the thesis it proposes is that the honour-conflict model, hitherto overlooked in studies on 1 Corinthians , provides an appropriate and compelling framework within which to view the many disparate aspects of the letter in their social context. Formerly the Journal for the Study of the New Testament Supplement , this is a book series that explores the many aspects of New Testament study including historical perspectives, social-scientific and literary theory, and theological, cultural and contextual approaches.